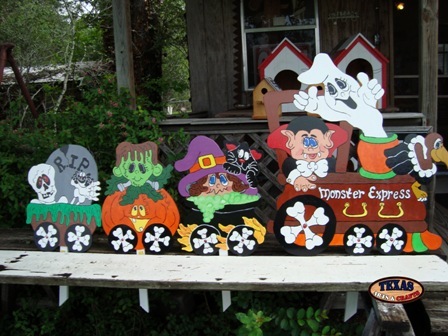 The Monster Express yard signs are built in our workshop. The conductor is hand painted brown. 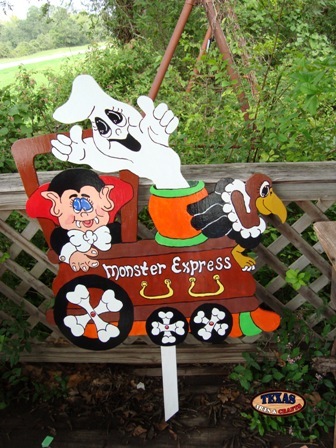 Dracula is driving the train in a black, white, and red suit; the white steam is a ghost; and there is a black and white buzzard sitting at the front of the train. The first car is a witch, with a purple hat and a black cat on her head, sitting in a black cauldron. The next car has a green Frankenstein sitting on an orange pumpkin. The caboose has a white skeleton next to a grave that says R.I.P. The dimensions for the Conductor yard sign are 34.50 inches tall by 32 inches wide by 2 inches deep. 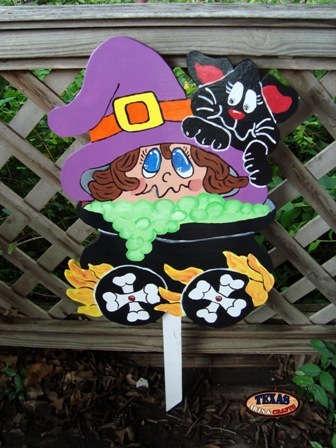 The sign has a 24.50 inch stake.The dimensions for the Witch in the Cauldron Car yard sign are 21.50 inches tall by 17.50 inches wide by 2 inches deep. The sign has a 24.50 inch stake. The dimensions for the Frankenstein car yard sign are 20.50 inches tall by 15.50 inches wide by 2 inches deep. The sign has a 24.50 inch stake. 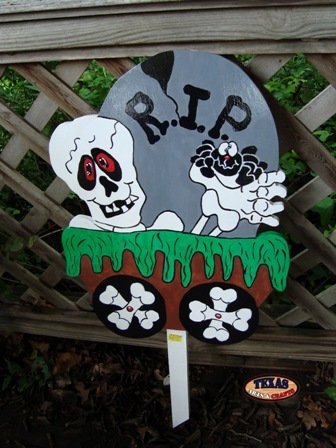 The dimensions for the Caboose Skeleton Car yard sign are 20.50 inches tall by 15.50 inches wide by 2 inches deep. The sign has a 24.50 inch stake. The combined weight of these items with packaging is approximately 25 pounds. For the continental U.S. shipping and handling is included in the listed price. For shipping outside the continental U.S. please contact us through our Contact Us page. 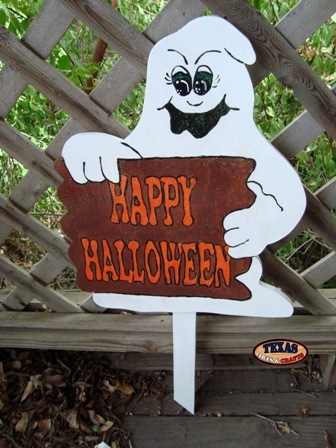 The Large Happy Halloween Ghost yard sign is built in our workshop. The ghost is hand painted white. The pumpkins are hand painted orange, the bat is painted black, and the spider is hand painted blue and green. The sign reads Happy Halloween. The dimensions for the yard sign are 52 inches tall by 39 inches wide by 2 inches deep. The sign has a 46 inch stake. This item can only be picked up at our shop or at one of our craft shows. 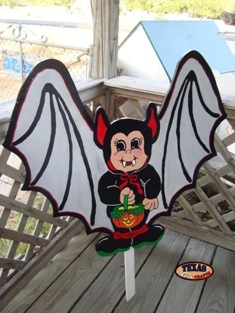 The Bat Boy yard sign is built in our workshop. The Bat Boy is hand painted black with gray wings. The dimensions for the yard sign are 29 inches tall by 32 inches wide by 2 inches deep. The sign has a 23 inch stake. The yard sign weighs about 10 pounds with packaging. For the continental U.S. shipping and handling is included in the listed price. For shipping outside the continental U.S. please contact us through our Contact Us page. 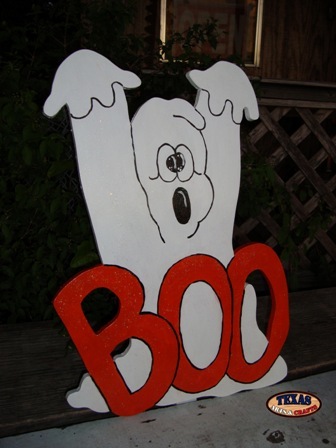 The Boo Ghost yard sign is built in our workshop. The ghost is hand painted white. The lettering that read "Boo" is orange. The dimensions for the yard sign are 22 inches tall by 16 inches wide by 1.50 inches deep. The sign has a 29 inch stake. The weight with packaging is 3.75 pounds. For the continental U.S. shipping and handling is included in the listed price. For shipping outside the continental U.S. please contact us through our Contact Us page. 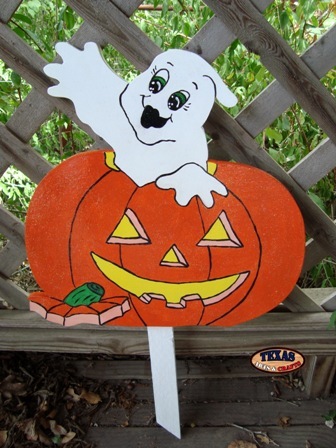 The Spooky Trick or Treat ghost yard sign is built in our workshop. The ghost is hand painted white. She is wearing a purple hat that reads Trick or Treat. The dimensions for the yard sign are 32 inches tall by 19 inches wide by 2 inches deep. The sign has a 31 inch stake. The weight with packaging is 10 pounds. For the continental U.S. shipping and handling is included in the listed price. For shipping outside the continental U.S. please contact us through our Contact Us page. The Happy Halloween Ghost yard sign is built in our workshop. 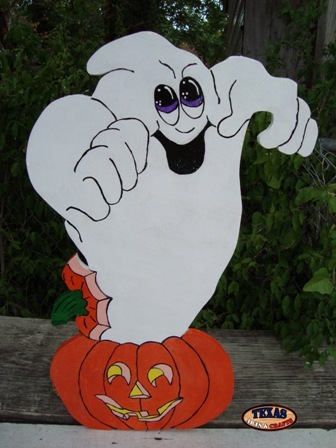 The ghost is hand painted white with a brown sign that reads "Happy Halloween" in orange letters. The dimensions for the yard sign sign are 16.25 inches tall by 13.50 inches wide by 1.50 inches deep. The sign has a 19 inch stake. The weight with packaging is 2.75 pounds. For the continental U.S. shipping and handling is included in the listed price. For shipping outside the continental U.S. please contact us through our Contact Us page. 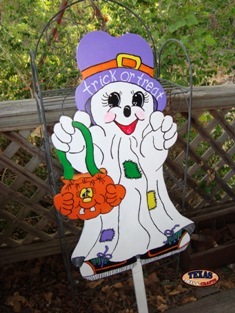 The Large Ghost With Small Pumpkin yard sign is built in our workshop. The ghost is hand painted white, and the pumpkin is hand painted orange with green stem. The dimensions for the arts and crafts sign are 22.50 inches tall by 14 inches wide by 1.50 inches deep. The sign has a 24.50 inch stake. The weight with packaging is 3.50 pounds. For the continental U.S. shipping and handling is included in the listed price. For shipping outside the continental U.S. please contact us through our Contact Us page. 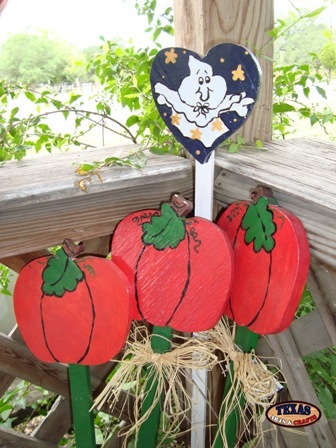 The Small Ghost With Pumpkin yard sign is built in our workshop. 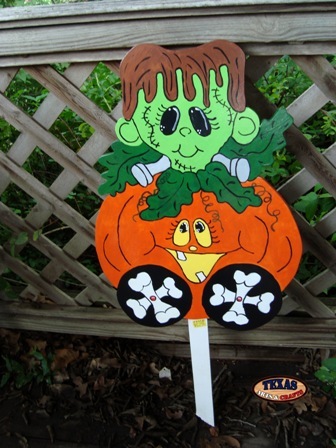 The ghost is hand painted white and the pumpkin is hand painted orange with green stem. The dimensions for the arts and crafts sign are 15 inches tall by 15 inches wide by 1.50 inches deep. The sign has a 16.50 inch stake. The weight with packaging is 3 pounds. For the continental U.S. shipping and handling is included in the listed price. For shipping outside the continental U.S. please contact us through our Contact Us page. 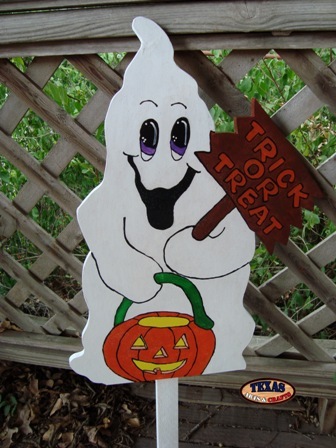 The Trick or Treat Ghost yard sign is built in our workshop. 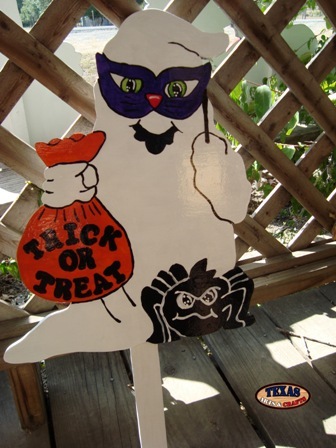 The ghost is hand painted white, the pumpkin is painted orange, and the sign is painted brown with orange lettering reading "Trick or Treat". The dimensions for the arts and crafts sign are 21.50 inches tall by 15.50 inches wide by 1.50 inches deep. The sign has a 22 inch stake. The weight with packaging is 3.25 pounds. For the continental U.S. shipping and handling is included in the listed price. For shipping outside the continental U.S. please contact us through our Contact Us page. The Bat and Pumpkin With Ghost yard sign is built in our workshop. 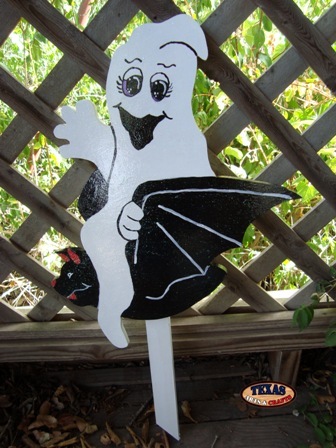 The ghost is hand painted white, the pumpkin is painted orange, and the bat is painted black. The dimensions for the arts and crafts sign are 20.50 inches tall by 19.50 inches wide by 1.50 inches deep. The sign has a 20 inch stake. The weight with packaging is 3.50 pounds. For the continental U.S. shipping and handling is included in the listed price. For shipping outside the continental U.S. please contact us through our Contact Us page. 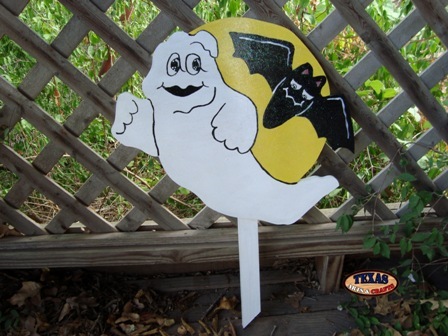 The Ghost on Bat yard sign is built in our workshop. The ghost is hand painted white. It is sitting on a black bat. The dimensions for the arts and crafts sign are 19.50 inches tall by 14.50 inches wide by 1.50 inches deep. The sign has a 16 inch stake. The weight with packaging is 2.25 pounds. For the continental U.S. shipping and handling is included in the listed price. For shipping outside the continental U.S. please contact us through our Contact Us page. The Ghost on Broom yard sign is built in our workshop. The ghost is hand painted white. 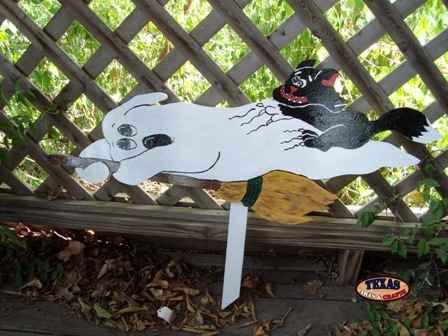 The ghost is on a brown broom with a black and white cat hanging onto the ghost. The dimensions for the arts and crafts sign are 33 inches tall by 13 inches wide by 1.50 inches deep. The sign has a 16 inch stake. The weight with packaging is 3 pounds. For the continental U.S. shipping and handling is included in the listed price. For shipping outside the continental U.S. please contact us through our Contact Us page. 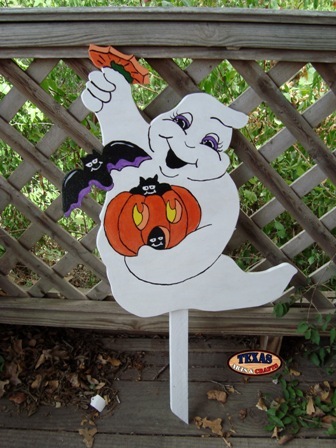 The Ghost with Bat yard sign is built in our workshop. The ghost is hand painted white. The ghost is flying by a yellow moon and black bat. The dimensions for the arts and crafts sign are 14.50 inches tall by 18 inches wide by 1.50 inches deep. The sign has a 16 inch stake. The weight with packaging is 2.75 pounds. For the continental U.S. shipping and handling is included in the listed price. For shipping outside the continental U.S. please contact us through our Contact Us page. The Masked Ghost yard sign is built in our workshop. The ghost is hand painted white. The ghost is holding a purple mask and an orange trick or treat back next to a black spider. The dimensions for the arts and crafts sign are 16.50 inches tall by 13 inches wide by 1.50 inches deep. The sign has a 16 inch stake. The weight with packaging is 2.50 pounds. For the continental U.S. shipping and handling is included in the listed price. For shipping outside the continental U.S. please contact us through our Contact Us page. The Ghost Pumpkin wood sign is built in our workshop. 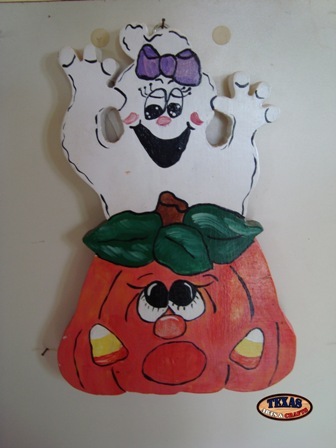 The ghost is hand painted white and the pumpkin is painted orange with green leaves. The dimensions for the hanging sign are 11 inches tall by 7.50 inches wide by .50 inches deep. The weight with packaging is 2 pounds. For the continental U.S. shipping and handling is included in the listed price. For shipping outside the continental U.S. please contact us through our Contact Us page. 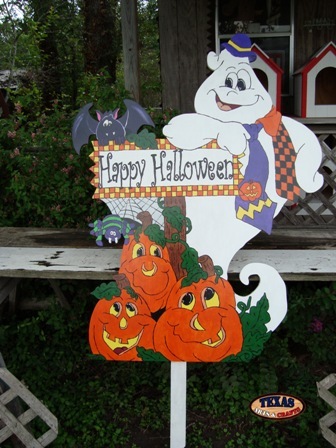 The Happy Haunting wood sign is built in our workshop. 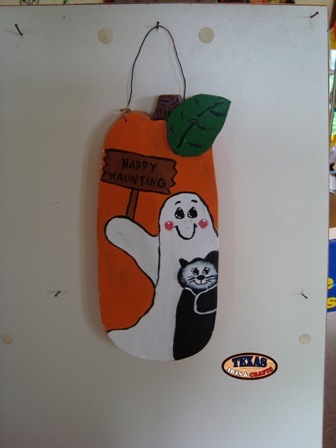 The ghost is hand painted white, the pumpkin painted orange, and the cat painted black. The sign reads Happy Haunting. The dimensions for the hanging sign are 12.50 inches tall by 5.50 inches wide by .50 inches deep. The weight with packaging is 2 pounds. For the continental U.S. shipping and handling is included in the listed price. For shipping outside the continental U.S. please contact us through our Contact Us page. 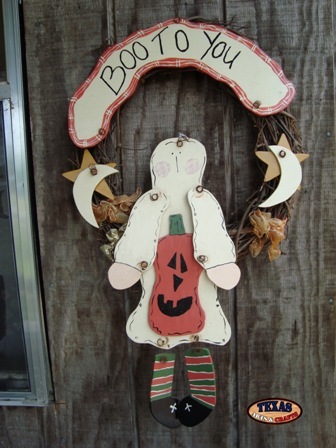 The Boo To You Wreath is built in our workshop. The girl is hand painted in a ghost costume holding an orange pumpkin. The sign reads Boo To You. The dimensions for the hanging wreath are 27 inches tall by 16.50 inches wide by 3 inches deep. The weight with packaging is approximately 3 pounds. For the continental U.S. shipping and handling is included in the listed price. For shipping outside the continental U.S. please contact us through our Contact Us page. The Ghost Heart With Three Pumpkins is built in our workshop. The heart is painted blue with a white ghost in the center. The three pumpkins are painted orange. The dimensions for the heart are 4.25 inches tall by 4 inches wide by 1 inches deep. The sign has a stake that is 24 inches tall. The pumpkins are 5 inches tall by 5 inches wide by .75 inches deep. The signs have a stake that is 24 inches tall. The weight with packaging is approximately 2 pounds. For the continental U.S. shipping and handling is included in the listed price. For shipping outside the continental U.S. please contact us through our Contact Us page.